The crisis of refugees from Syria and elsewhere in the region and Africa is the most pressing refugee crisis since World War II. We are pained and challenged by the millions of refugees worldwide, including the plight of the more than 11 million Syrian and Middle Eastern refugees who have been forced to flee their homes because of ongoing violence. We are instructed in the Holiness Code (Lev. 19:33) to take to heart the lessons of our own history by treating aliens in our midst with justice and compassion. “The stranger who sojourns with you shall be to you as the native among you, and you shall love him as yourself for you were strangers in the land of Egypt." Each of us can help respond to this humanitarian crisis. These resources will be updated as more information and opportunities arise, so please check back often. HIAS rescues people whose lives are in danger for being who they are. We protect the most vulnerable refugees, helping them build new lives and reuniting them with their families in safety and freedom. 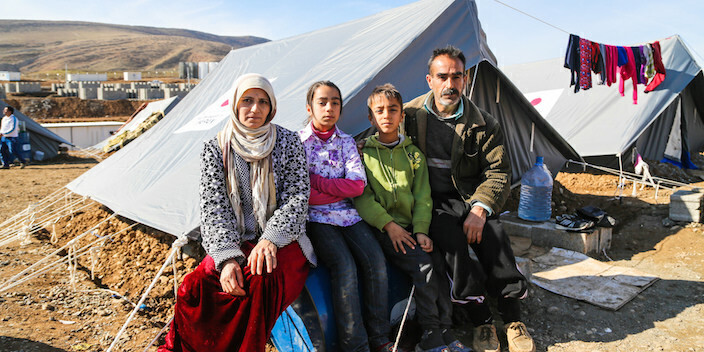 We advocate for the protection of refugees and assure that displaced people are treated with the dignity they deserve. Guided by our Jewish values and history, we bring more than 130 years of expertise to our work with refugees. Jewish Coalition for Disaster Relief (JCDR) has a dedicated fund to support Syrian refugees in the Middle East and Europe. The JCDR is a coalition comprised of all of the major Jewish denominations and our affiliates. IsraAid: For over a decade, IsraAID has been helping people all over the world overcome extreme crises and has provided millions with the vital support needed to move from destruction to reconstruction, and eventually, to sustainable living. International Rescue Committee: The International Rescue Committee helps people whose lives and livelihoods are shattered by conflict and disaster to survive, recover, and gain control of their future. IRC teams provide health care, infrastructure, learning and economic support to people in 40 countries, with special programs designed for women and children. Every year, the IRC resettles thousands of refugees in 22 U.S. cities.